An 11.2 million kroner grant from the Ministry of Higher Education and Science will help shed light on what the unknown 95 percent of substances and energy in the universe are composed of. The grant will be directed towards upgrading the University of Copenhagen’s measurement and data-processing facilities at the Danish part of CERN and will guarantee our future ability to gather knowledge about the early universe and its fundamental building blocks. Only five percent of the substances that make up our visible universe and everything around us are provisionally understood and described by science. CERN is the world's largest particle physics test facility. Here, on the outskirts of Geneva, researches look for the remaining 95 percent of the universe’s substances by beaming particles against one other in collisions that create a type of ‘mini-Big Bang '. 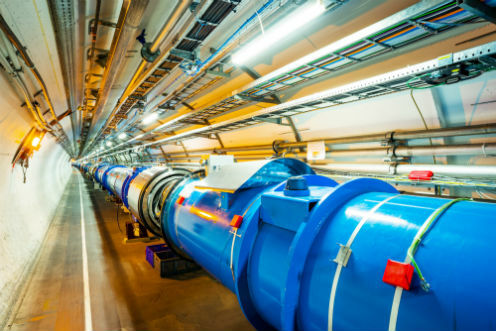 The detector upgrades are part of a major upgrade process throughout CERN, especially of its flagship 27 km long superconducting Large Hadron Collider (LHC). The overall upgrades are scheduled to continue until 2025 and are being financed by CERN member nations, including Denmark. The upgrades will allow for multiple collisions – 50,000 per second – and thereby increase the probability of discovering new particles. "We will be able to study multiple new phenomena as a result of the increased collision rate and improved detectors. For me, there is no doubt whatsoever that boundaries will shift. Naturally, we also hope that the revolutionary breakthroughs ahead will change our understanding of nature,” says Jens Jørgen Gaardhøje. Another portion of the grant is going to the University of Southern Denmark to upgrade the ABACUS high-performance computer-farm. The Ministry of Higher Education and Science grant is being matched with university co-financing.